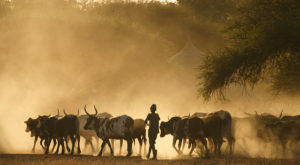 Herders return home at dusk. Photo credit: ILRI/Stevie Mann, Flickr. Improving the livelihoods of livestock smallholders and other value chain actors through livestock value addition and marketing is constrained by the lack of access to finance, working capital, affordable quality inputs, and well-structured value chains. To address this issue, the International Livestock Research Institute (ILRI) in partnership with the Swaziland Water and Agricultural Development Enterprise (SWADE) and the Micro Finance Unit, Swaziland (MFU) are organizing an international conference on livestock value chain finance and access to credit. The forum will be held in Swaziland on 21-23 February 2017. Proceedings book of the International conference on livestock value chain finance and access to credit, held in Swaziland on 21-23 February 2017, is available here. The Conference’s Scientific Committee invites authors to submit abstracts for oral and poster presentations. Abstracts should be 400 words maximum. Submissions should clearly indicate whether the author is willing to make an oral presentation or a poster. The conference is being organized with financial support from the International Fund for Agricultural Development (IFAD) and as part of the research on value chains under the CGIAR Research Program on Policies, Institutions, and Markets.